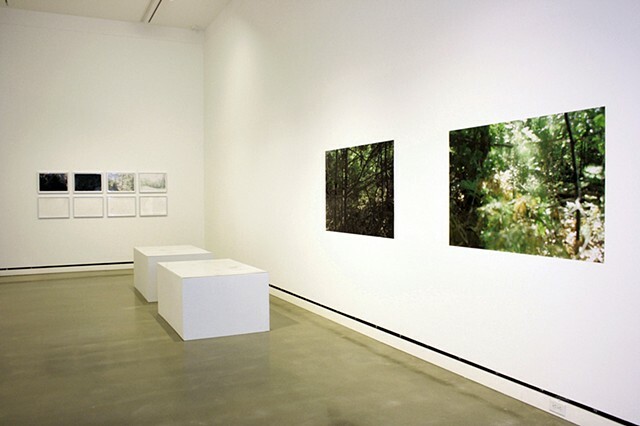 Installation View of the series "Out of the Light and Into the Shadows" from the exhibition, "Vertical Currency" at the Rochester Art Center. My work in the exhibition included two 40 x 60 inch hand-cut digital c-prints mounted directly to the wall with corresponding graphite transfer drawings displayed on pedestals below. The back wall included four framed 13 x 20 inch hand-cut digital c-prints hung above four corresponding graphite transfer drawings.